Why Should you Choose us Over Lexington Law? 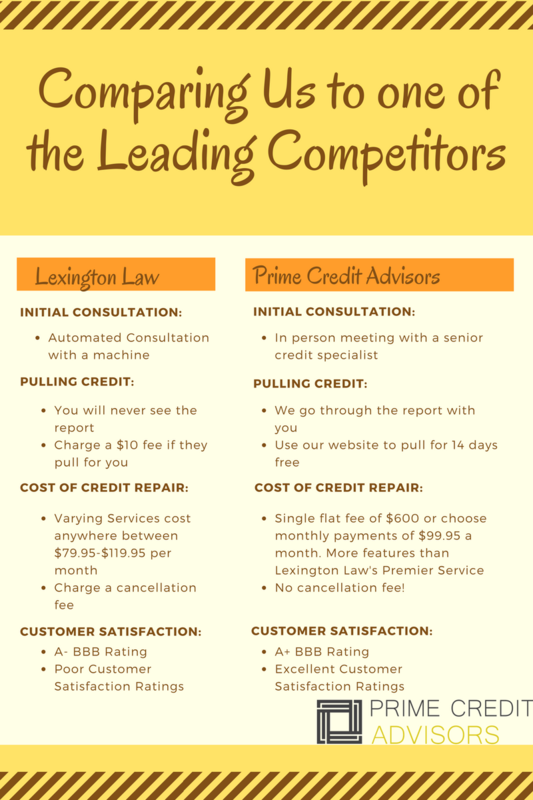 Lexington Law is one of the leaders in the credit repair industry. However, they have also accumulated a bad reputation while attempting to help their customers. We strive to provide the best customer service possible and ensure that each of our customers is assisted personally with the best service possible. We’ve analyzed Lexington Law’s services against our own so you can see the difference in service we offer! Lexington Law will allow you to call and have someone analyze your credit report and explain their services to you. However, their consultation is an automated script that offers the same services to nearly every customer. We pride ourselves at going above and beyond for our customers. We always would like our customers to personally come into our office for a personal consultation. We also do not accept business unless we know for sure that we will be able to assist you with your goal. We ensure that you know every service that you are paying for, and do not offer additional services for a larger price. At our office, you get every service Lexington Law offers with their largest sum. Lexington Law pulls your credit for you, and may also charge a $10 fee in order to do so. They never send you the credit report, they simply use it for their own purposes so they know what they need to fix. We either receive your credit from a loan officer that referred you to our company, or we have a website which will allow you to pull it for yourself. The site has a free 7-day trial, which gives you enough time to pull the report, send it to us, and allow us to analyze it before you are ever charged! Lexington Law offers three different services, ranging from $79.95 to $119.95 per month. Each of these services includes different features for you to get more updates or benefits from the service. However, none of these services give any additional benefit to your credit. They also charge an initial charge to begin work on your account. If you plan to cancel your account, Lexington Law treats their service like a utility bill, forcing you to pay a fee at the end of the service for cancellation. In addition, if you have trouble affording their fees, they do not offer any sort of consolidation. They simply state the benefits of repairing your credit in comparison to buying things on bad credit. We charge a single flat fee of $600 for the entire credit repair process. This process includes all of the nice features included in Lexington Law’s premium package. We believe that every customer has the right to receive updates on their file whenever they would like. you will have access to your own account on our CRM system, and there you will be able to see everything about your account. For people who have difficulty coming up with the funds to pay the fee, we offer a monthly payment program which is roughly the same price as Lexington Law’s median package. Although Lexington Law has an A- rating with the BBB, their ratings overall have suffered from their poor customer satisfaction. Their automated process makes it difficult for them to fix everyone’s credit, because everyone’s credit is unique and requires special attention. We make every possible attempt to give every customer a personal approach that best suites them and their credit. We take great pride in our customer satisfaction and our A+ rating from the BBB. When you work with us, we ensure you have all the resources to be successful and always encourage you to communicate with us whenever you would like an update or need any assistance.